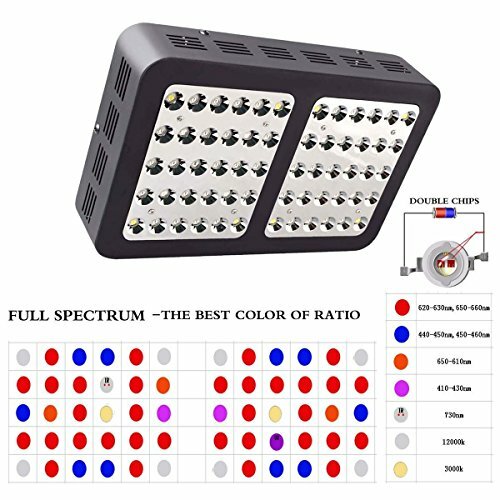 -Full Spectrum: 650nm~660nm, 620nm~630nm, 580nm,615nm,460nm~470nm, 440nm~450nm, IR,White LEDs. -60pcs High Intensity 5Watt Bridgelux/Epileds LED Chips. -Max Coverage: 3 x 3ft at 24" Height. -Core Coverage: 2 x 2ft at 24" Height. -Replaces a 250 wattlamp beads use epileds leds. -Use for all stages of plant growth. -Scientifically engineered to keep the balance of the PAR/Lumen Output and Coverage. -The optimal full spectrum which provides plants Veg and Flower all stages with everything they desire in the natural sunlight. -Upgraded Two 3" fans and big aluminum cooling heat sinks (0.8" height) are easy for heat dissipation. -High Intensity 5Watt Bridgelux & Epistar LEDs, low energy consumption. -Strong hanging Kits are available for easy installation. -All LEDs with a Zener inside to ensure one LED goes out the rest continue to operate. -Long lifespan, energy saving and environmental protection. Replaces a 250 wattlamp beads use epileds leds. Scientifically engineered to keep the balance of the PAR/Lumen Output and Coverage. Triple-Head LED Plant grow lamp With Flexible Necks and Three Independent Switches. For Use With Tobacco, Hydroponics, Greenhouse Horticulture, Indoor Plants and Home or Office Potted Plants.